Heating and air conditioning systems control the temperature, humidity, and overall air quality in homes, businesses, and other buildings. By providing a climate controlled environment, refrigeration systems make it possible to store and transport food, medicine, and other perishable items. Although trained to do all three, HVAC technicians sometimes work strictly with heating, air conditioning, or refrigeration systems. They also may specialize in certain types of HVAC equipment, such as water-based heating systems, solar panels, or commercial refrigeration. Depending on the task, HVAC technicians use many different tools. For example, they often use screwdrivers, wrenches, pipe cutters and other basic handtools when installing systems. To test or install complex system components, technicians may use more sophisticated tools, such as carbon monoxide testers, voltmeters, combustion analyzers, and acetylene torches. When working on air conditioning and refrigeration systems, technicians must follow government regulations regarding the conservation, recovery, and recycling of refrigerants. This often entails proper handling and disposal of fluids. Some HVAC technicians sell service contracts to their clients, providing regular maintenance of heating and cooling systems. Other craft workers sometimes help install or repair cooling and heating systems. For example, on a large air conditioning installation job, especially one in which workers are covered by union contracts, ductwork might be done by sheet metal workers and duct installers, or electrical work byelectricians. In addition, home appliance repairers usually service window air conditioners and household refrigerators. We’re not the new guys in town; we’ve been serving many of your Philadelphia area neighbors with quality workmanship since 1953. 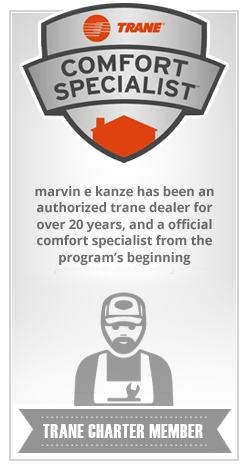 All of our employees are factory trained, and then retrained when they join Marvin E. Kanze to do things the “Kanze Way.” It means having our employees go that extra mile to meet that extra mark of quality that comes standard with all of our work. Copyright © 2017 Marvin E. Kanze, inc.